First make the hollandaise. Put the white wine vinegar in a small saucepan with 50ml/2fl oz water, the peppercorns, bay leaf, shallot and mace blade. Bring to the boil and simmer until the liquid has reduced down to 2 tablespoons. Place the butter in a medium pan over a low heat, so that it starts to melt but doesn’t burn. When the butter has melted, take it off the heat. Put the egg yolks in a heat-proof bowl with a pinch of salt. Whisk in the white wine reduction then place the bowl over a simmering pan of water. Gradually add the melted butter, just a few drops at a time to start with, whisking constantly, until you have a thick emulsion, then keep pouring it in a slightly faster, steady stream until it is all incorporated and you have a thick, glossy sauce. Taste for seasoning and add a squeeze of lemon juice or a pinch of sugar to balance the flavours. For the purposes of this recipe, you can cool by putting the bowl into a larger bowl filled with iced water. For the pie, put the salmon in a large pan and just cover with cold water. Bring to the boil, then cover and simmer for 2 minutes. Remove from the heat and leave for a further 5 minutes. Strain off the liquid and then leave the salmon to cool. When it has cooled, flake, keeping the pieces as large as possible. Wash the spinach thoroughly, then without draining too thoroughly, put in a saucepan. Put on a medium heat and push the spinach down with a wooden spoon – it will wilt down quite quickly. When is has completely collapsed leave to cool, then wring out as much liquid as possible. Preheat the oven to 200C/180C Fan/Gas 6. Unroll the puff pastry. 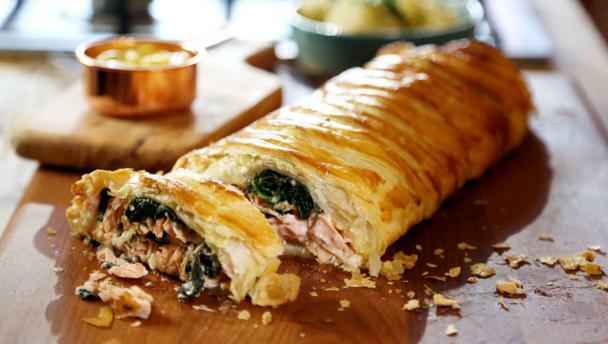 Arrange half of the salmon over the bottom half of the pastry, leaving a 2cm/¾in border along the bottom. Season with salt and pepper, and top with half of the spinach. Stir the lemon zest and tarragon into the hollandaise if using, then put half of the hollandaise over the spinach. Repeat these layers with the remaining salmon, spinach and hollandaise. Brush the border and exposed pastry with beaten egg, then fold it over and roll the edges over to look rope-turned. Brush with egg wash and cut a few slits along the top of the pastry. Bake in the oven for 35–45 minutes, or until the pastry has puffed up and is a rich golden-brown, and the filling is piping hot.